These cute little gummy chicks are almost too cute to eat! This big bag of sugared chicks comes in pastel colors, such as pink, green, yellow, and blue. 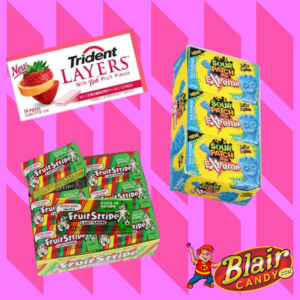 Get the SweeTARTS taste you love with fun gummy candies! These sugared bunnies come in the Sweettart flavors you know with a festive twist. If you leave out treats for the Easter Bunny, be sure to leave him these Jolly Rancher gummies. This bunny food mix has green apple, lemon, orange, and cherry flavors that the Easter Bunny will love. There’s plenty of gummy candy to go around this Easter! 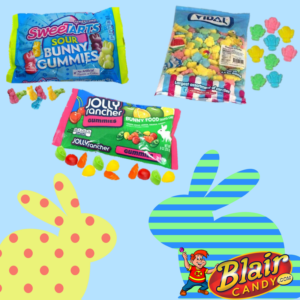 Check out BlairCandy.com for all of your Easter candy and your gummy candy favorites. Chocolate Covered Peeps. Yes you heard us right! Start melting chocolate for this delicious treat. S’mores. A simple, yet delicious snack. You’ll most likely have all of the other ingredients in your pantry, just add Peeps! Driving Bunnies. This one you have to see to believe. Take Peeps Bunnies, Twinkies, and other items you have on hand to make these cute little cars! Have fun making these sweet treats. 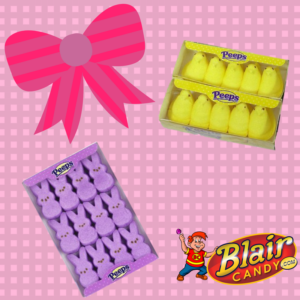 For all of the Peeps marshmallow candy and other Easter treats, go to BlairCandy.com to order today! A classic, the Hershey’s milk chocolate bar is great for snacking, making s’mores, or adding to your favorite recipes. Tons of possibilities with these bars! Add a little crisp to your chocolate with the Hershey’s Cookie Layer Crunch. With layers of chocolate and cookie, you’ll love this candy bar twist. Don’t forget the sugar free candy. Hershey makes it easy to enjoy without the guilt with their sugar free chocolate bags. 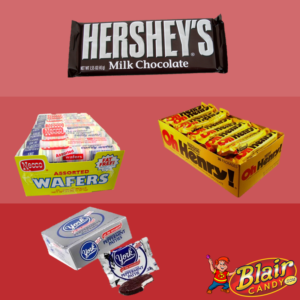 Stock up on wholesale Hershey candy bars and other favorites today at BlairCandy.com! We did a blog post like this a little while ago, but with many gluten free candy bar choices, we had to have a part two! Many people don’t realize that a lot of classic and retro candy bars are gluten free. These are some more candy bars that you might not have realized are gluten free. Good news chocolate lovers! As long as you are enjoying the 1.55oz bar, you’re in store for a chocolaty, gluten free treat. This also includes the 1.45oz almond filled version. Who doesn’t love this colorful candy? You’ll be happy to know these, along with their Valentine’s Sweethearts and the Chocolate Wafers, are free of gluten. Mint and chocolate is a classic combo that everyone loves. While we can’t speak for some of the other York varieties, the standard York Peppermint Pattie is gluten free. If you haven’t tried this classic candy, get to it. This candy bar is full of peanuts, caramel, and fudge that are covered in chocolate. Pretty great gluten free candy huh? For more gluten free candy bars, check out our previous post on our blog. 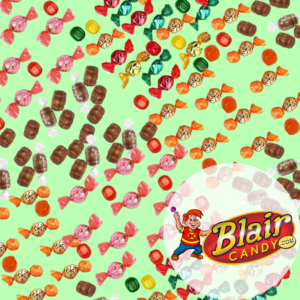 Also, be sure to visit BlairCandy.com to check out all of their gluten free options. We even have vegan candy! No matter your dietary restrictions, we have a candy for you. 3 Gummy Candy Treats to Try! 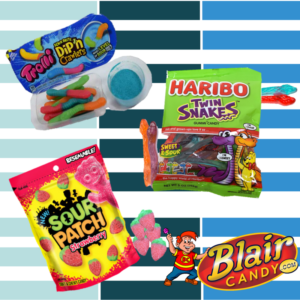 Trolli Dip’n Crawlers take your favorite dipping candy and give them a sour gummy twist! Each pack contains the gummy worms we all know and love along with a cup of sour sugar. Haribo Twin Snakes give you both sweet and sour flavors all in the same bag. You never know what you’re going to get with each snake. Strawberry is a pretty great flavor, but Sour Patch only made it better! Try these Sour Patch Strawberries for sweetness with a kick! Add a little sour bite to your day. Try these and other sweet gummy candy treats at BlairCandy.com. Are these Easter Candies in Your Basket? 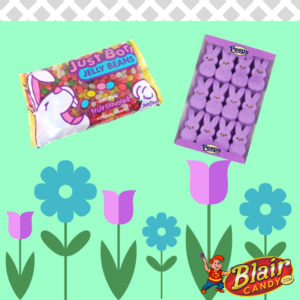 Just Born candy has plenty of treats, especially at Easter, but who doesn’t love jelly beans at Easter? Try one of many Just Born Jelly Bean flavors to really get into the holiday. If you love Snickers bars, then you’ll love these eggs! Egg shaped Snickers not only make a funsnack, but they also are great to add to an Easter basket of any size. Like more of a classic treat? 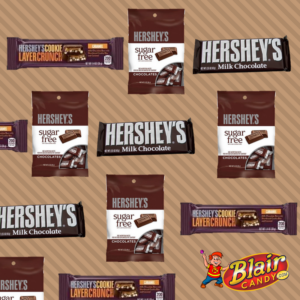 Look no further than these Hershey’s bars. They have festive designs on the wrapper and are ready for baskets. 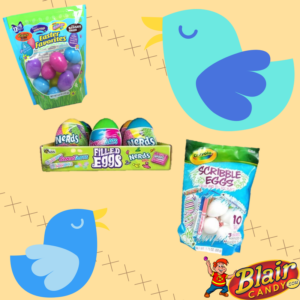 Find these and more Easter candy treats at BlairCandy.com! You’ll find all of your favorite holiday brands such as Just Born candy, Zitners, and even Cadbury. Visit them today to enjoy Easter candy throughout the whole season. We’re pretty sure the Easter Bunny eats this all the time. Grab some white chocolate, jelly beans, chocolate eggs, and a few other things in your pantry to make this Easter fudge. Chocolate covered pretzels are pretty great, but take it to the next level with a Peep! All you need are pretzel rods, Peeps, melting chocolate, and decorative sprinkles and you’re ready to create a delicious snack. But what do you do if you have candy, but need to give it to a friend? These decorative bunny boxes are a great way to gift your favorite Just Born candy treats. There are plenty of fun and easy Easter snacks and treats out there! 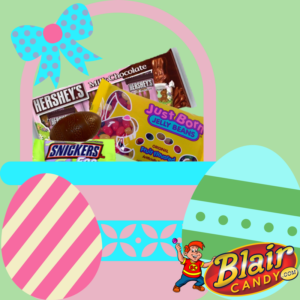 Get more inspiration and stock up on your favorite Easter candies by visiting BlairCandy.com. Wonka candy fans will be happy with these eggs. Each egg is filled with either Sweetarts or Nerds candies. Add another easy activity to your Easter with these Crayola eggs. Kids will love being able to color their Easter eggs and adults will love how much cleaner it is than regular egg dyeing. If you’re having a colder Easter, these eggs won’t melt. Each of these eggs has a chocolate favorite, such as Reese’s or Hershey’s candy. Don’t forget that we have wholesale Easter candy. Shop now to get all of your Easter candy and cross off a few tasks on your to-do list this Easter.